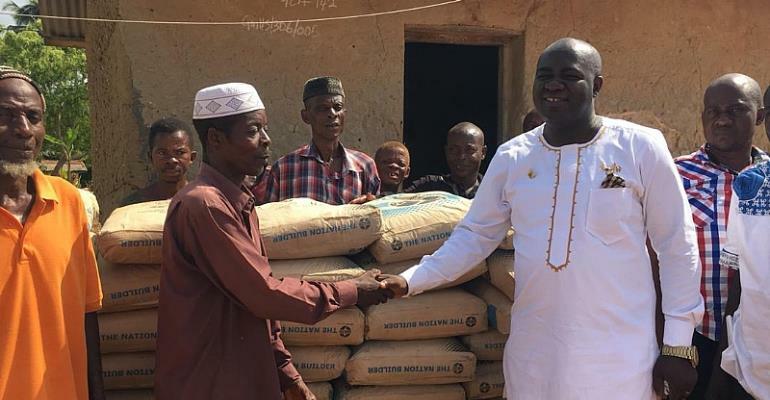 The District Chief Executive (DCE) for Asene Manso Akroso, Mr. Alex Incoom has presented 100 bags of cement to the chiefs and people of Akyem Tabita to support the commencement of work on a 3-unit classroom block with an office and a store for Tabita DA Junior High School. At a short ceremony to present the items on behalf of the Assembly, the DCE said, the initiative forms part of the Assembly’s strategy of ensuring rapid development of educational infrastructure in the District. He explained that, in such an initiative, materials such as cement, iron rods and roofing sheets would be supplied by the Assembly to interested communities that are willing to contribute their labour, sand, gravel, wood, water, and meal towards the construction work for provision of educational infrastructure. According to him, he was moved by the persistent appeal made by the Assembly member for the area who agreed with the conditions of the initiative to have an additional school block to accommodate the increasing number of pupils. He gave an assurance that the Assembly would continue to contribute towards the project to ensure its early completion. Receiving the items on behalf of the community, the Assembly member for the area, Mr. Alfred Baiden expressed his profound gratitude to the Assembly for the honour done them and pledge their support towards the completion of the project on schedule. The DCE was accompanied by the Chairman of works sub-committee of the Assembly, Mr. Emmanuel Mireku Yeboah and other members of the works sub-committee and some constituency executives of the ruling New Patriotic Party (NPP).